No, ATLAS is not a map of the world; it's a a 330 pound hydraulic humanoid robot—and a very good one at that. Created by Boston Dynamics, the robot looks and moves like an actual human. 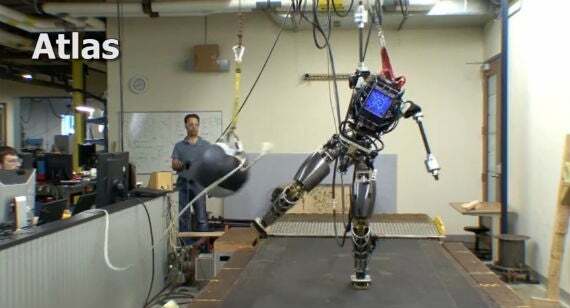 ATLAS is heavy by human standards, but it uses its weight to withstand having objects like a wrecking ball being thrown at it. In addition, its balancing system means it can right itself similar to how a stumbling human. can ATLAS also has a skeleton and joint system much like our own, so it moves a lot like a person, even down to its wrist movements. It's a little like a metallic version of Superman, actually, only without the susceptibility to kryptonite. As part of the DARPA Robotics Challenge, Boston Dynamics designed the bot to eventually assist emergency workers in a disaster. It's also fairly responsive thanks to all the sensors in its head: It can see, listen, and "think" in order to assess how to deal with obstacles ahead. Teams from the DARPA Robotics Challenge will use ATLAS in a disaster response simulation as part of the first physical stage of the competition. Those who use the robot to its best ability will get extra funding to work on their own robotic projects so they can take part in the final challenge in 2014, worth $2 million. With the power of ATLAS in mind, it might be time to start thinking about an escape plan should the robots take over, because machines this impressive really could. I know I am, as I am considerably clumsier than this robot!